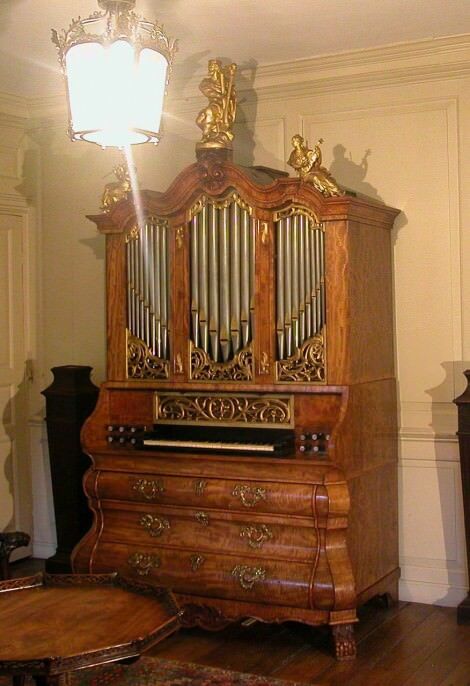 The organ was made in around 1775, perhaps by Hendrik Anthonie Meyer (1744-1812), a German who worked in Amsterdam. It was purchased by Alan Rubin for his collection in 2004. The previous owners purchased it in 1910. It is listed as catalogue number 383 in Jan Gierveld’s Het Nederlandse Huisorgel in de 17de en 18de eeuw (Utrecht 1977), where it is illustrated in colour on the front cover. The date and attribution are Gierveld’s. The organ was restored under the direction of Edward Bennett in 2005-6. The key compass is C – e³ (53 notes). The pitch is A412.2Hz (16ºC) and the tuning is an 18th century circulating temperament. The case is veneered in satinwood, and was restored by Chris Wells of Stannington near Sheffield.